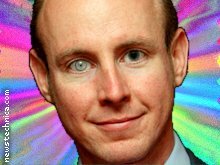 THE MEMORY HOLE, Wolverhampton South West, Thursday (NNN) — Labour has criticised Tory MEP Daniel Hannan for citing Adolf Hitler in an interview. The MEP caused controversy two weeks ago when he gave a stirring speech on US television saying that the NHS would lead to “rivers of blood” — prompting Tory leader David Cameron to ask the media to “pay no attention to the silly, silly man behind the curtain” and gently remind Mr Hannan that getting elected next year would be quite nice, thanks. Mr Hannan also became a hit on the video sharing site YouTube, with a three minute speech in the European Parliament attacking Gordon Brown, that was set to a clip from the movie Downfall and had “Dragostea Din Tei” as backing music. Hitler was Libertarian though – he wanted to liberate the countries of Europe from their oppressive governments.